Written by renowned risk expert Jon Danielsson, the book begins with an introduction to financial markets and market prices, volatility clusters, fat tails and nonlinear dependence. It then goes on to present volatility forecasting with both univatiate and multivatiate methods, discussing the various methods used by industry, with a special focus on the GARCH family of models. The evaluation of the quality of forecasts is discussed in detail. Next, the main concepts in risk and models to forecast risk are discussed, especially volatility, value-at-risk and expected shortfall. The focus is both on risk in basic assets such as stocks and foreign exchange, but also calculations of risk in bonds and options, with analytical methods such as delta-normal VaR and duration-normal VaR and Monte Carlo simulation. The book then moves on to the evaluation of risk models with methods like backtesting, followed by a discussion on stress testing. The book concludes by focussing on the forecasting of risk in very large and uncommon events with extreme value theory and considering the underlying assumptions behind almost every risk model in practical use – that risk is exogenous – and what happens when those assumptions are violated. Every method presented brings together theoretical discussion and derivation of key equations and a discussion of issues in practical implementation. Each method is implemented in both MATLAB® and R, two of the most commonly used mathematical programming languages for risk forecasting with which the reader can implement the models illustrated in the book. The book includes four appendices. 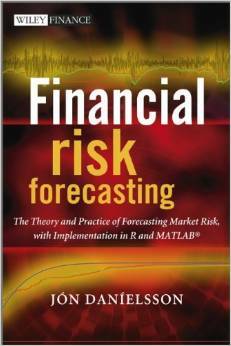 The first introduces basic concepts in statistics and financial time series referred to throughout the book. The second and third introduce R and MATLAB®, providing a discussion of the basic implementation of the software packages. And the final looks at the concept of maximum likelihood, especially issues in implementation and testing. This is an outstanding book on empirical finance. I wholeheartedly recommend it. Financial Risk Forecasting is a tour de force. It is one of those rare works which successfully combine accessibility with academic rigour; it is copiously and most informatively illustrated. The addition of computer code, in commonly-used programming languages, for the implementation of concepts and techniques demonstrates a profound understanding of practical issues. With risk-based regulation now dominating the financial landscape post-crisis, this book is a timely and authoritative resource for both students and practising financial analysts, of whatever stripe. It will join that select group of works on my bookshelf that have become dog-eared from repeated use over the years. More than ever risk managers in financial institutions have to assess the risk of financial products and portfolios in a rigorous way. With his new book, Professor Danielsson has risen to the task and produced a great book that combines his expertise with years of teaching market risk at LSE and other major universities. With perfect timing, this book achieves two objectives the academic and scientific community had to face: on the one hand it addresses the latest analytical techniques in the exact computation of risk measures, their use and their limitations, and on the other hand it considers the issue of risk pricing during a crisis. A real accomplishment and a must read for both risk professionals and students in the quantitative finance track. I believe that this book covers the spectrum of quantitative techniques that any student of risk management should cover. The book moves gradually from traditional risk measures to downside risk measures and their application in stress testing. Advanced estimation of volatility models and use of extreme value theory are not eschewed and are the way to go for scenario analysis. A great added value of the book is the programs for all routines both in R and MATLAB®. The book ventures into the barren area of endogeneity of risk drivers. If I have to make a prediction, I would venture that this will keep scientists and markets busy for years to come. In short, a highly recommended book for any student of modern risk management techniques and their uses. All rights reserved, Jon Danielsson, 2011-2019.